The 1982 film has embedded itself deep in my psyche and any follow up would have to be something special. What followed has left me chewing contemplatively on my mental cud and prompted me to put fingers to keyboard to create one of my infamous movie reviews for this fair website of ours. As the lights went down in the cinema where myself and Fake Crumbly were sitting, I knew that Tron: Legacy would be very much its own film where, on screen, the Disney castle, instead of being portrayed as the abode of certain anthropomorphisised mice and ducks, is rendered in the harsh neon glow of the electronic world that we were going to be accustomed to. The camera then zooms into a scene of domestic bliss. Kevin Flynn, now looking ten years or so older, is tucking his 9 year old son, Sam, into bed. Instead of telling him a bedtime story, he is regaling him with his tales of his time he spent on the Game Grid; the virtual world inside the Encom Corporation mainframe, fighting the MCP and its lackey, Command Program Sark, and also of his friends, Ram Yori, and Tron; the security program. He tells Sam of his epic disc and light-cycle battles and of his time exploring that strange world, seemingly beyond the reach of any Human. Whenever Sam asked Kevin if he could go to the Grid, Flynn would always smile enigmatically and say: "Soon..."
Cut forward twenty years and Sam Flynn is an angry and disaffected young man, ever since the mysterious disappearance of his father twenty years ago, he has led a wasted life. Even though he has been cared for by his grandparents and is a majority shareholder in Encom, he cares little for the politics of the boardroom and prefers to go riding on his motorcycle and performing a yearly practical joke on the board members of Encom. This years joke entails sabotaging the launch of Encoms latest disc operating system and then base-jumping from the roof of the Encom building. Sitting in his apartment, moodily sipping on a beer, he is shaken out out of his reverie by his family friend Alan Bradley. He has climbed through the ranks and is now CEO of Encom. He sits down and tells Sam that he has received a message on his pager, allegedly from Flynns amusement arcade on a phone number that has been disconnected for almost 20 years! Sams curiosity is piqued and he rides over to the arcade. Opening the door and stepping into the dust-filled gloom, he throws the main power switch and all the old arcade cabinets of over 20 years of age start up with their 1980's electronic beepings and serenades. Looking down one of the aisles, he sees one of the old Tron arcade games that his father used to play on when the arcade was open. Putting a coin in the slot, he is surprised when a token falls out the slot and the cabinet pivots open on hidden hinges. Behind the machine is a staircase leading down to a basement that is filled with machinery and a computer terminal. Something that did leave me feeling rather shortchanged was the transition to the Electronic world. In the first movie, we are drawn down, from Flynns point of view, into the shifting canyons of light and electronic impulses of the System and over the rectilinear cloudscapes and cities of the Grid. However, this time around, the transition is a lot more sudden. We just see a subtle, but digitally rendered, shifting of reality. Sam is still seated at the keyboard but everything seems changed slightly. Everything is monochromatic and sharply in focus. Disorientated and panicked, Sam bursts out the door of the arcade and is taken aback at the sight that greets him. Outside he is presented with the sight of a vast city, its vehicles and inhabitants futuristic and otherworldly in appearance. Realisation hits his as he realises he has been transported to the Grid. Looking overhead, he sees rolling dark clouds and flickerings of light that are reminiscent of lightning. All of this is swept aside as he sees something hove into view that he has never seen before but is all too familiar to him; the dread shape of a Recogniser. The huge inverted U-shaped craft lands in front of him and before he has a chance to flee, he is bundled inboard by two burly guards. After being shackled in place for his trip to a destination as yet unknown to him, Sam has a chance to look around at his fellow captives. Numerous game sprites and programs look back at him with expressions ranging from the mildly interested to the openly hostile. Through the translucent floor of the Recogniser, the city passes beneath him, alight with a neon blue glow and Game Tanks can be seen patrolling its streets. All too soon, the Recogniser lands and Sam and some other programs are escorted away while others are taken off to an unknown location and fate. Ushered into a marshaling area where he is stripped of his Human clothes and dressed in a figure-hugging one piece jumpsuit and a Game Disc is affixed to his back. To the Sirens that dress and arm him, he is just another program going into the games. Before he knows it, he is in a transparent many-planed court hovering above a vast arena, below it are stands and terraces holding a throng of programs clapping and cheering as the games get under way. Sam has to learn fast as he is in a disc battle and it's a fight to the death. Luckily, he manages to defeat his opponent but he is then up against the Champion of the system; Rinzler. Nothing can be seen of his face as it is hidden behind a blackened visor. He is taken from the disc-battle court and stood before a masked figure seated in a throne-like chair. The mask folds away to reveal... Kevin Flynn. Looking the same as he did all those years ago when he left for work never to come back, Sam is over joyed but puzzled why his father is less than overjoyed to see him. It is then that the man standing before him is not his father but the program Clu. It is then that he discloses the fact that it was he who sent the message to Alan Bradleys pager. He knew Sam was intelligent and curious enough to find the hidden lab beneath the arcade and to be transported to the Grid to look for his father. Clu wanted to meet the son of the creator of the new system and now that he has, he has one thing left on his mind; the eradication of the son as well as the father. The throne ship touches down in the middle of the vast arena and Sam is forced to participate , along with several frightened programs, in a light cycle contest against Clu and his lieutenants. One by one, his companions are killed and Sam is left, light cycle-less on the grid, about to be mown down by Clu until a mysterious vehicle screeches up beside him and the driver beckons him on board. Sam is somewhat surprised to see that the driver of the Grid-Runner is an attractive female program called Quorra and she is taking him to safety and to meet his father. Sam is taken aback as he had thought that his father was dead. Quorra explains that his is alive and has had to take refuge in the wilderness known as the Outlands. She assures him that all will be revealed when he meets him. The meeting between Sam and Kevin Flynn is a rather strained affair. Sam was bursting with questions about his fathers disappearance but Kevin Flynn was surprised to see Sam on the Grid. Flynn told Sam that, thanks to the laser array in the arcade basement, he had been making numerous visits to the System and with the help of his old friend Tron, they had set out to create the perfect system, a digital Elysian Fields. To aid them in their efforts, Flynn had created a more powerful version of his original Clu program, who was originally derezzed by the Master Control Program in the first film. Unfortunately, as Clu evolved, he became more possessed by the thought of a 'perfect' system. In his eyes, this meant a system free from flaws and imperfections. In the meantime, Flynn and Tron had made contact with a race of beings called Isomorphic Algorhythms (ISO's), a race of beings that had spontaneously appeared in the system and could help provide Flynn and Tron, and subsequently humanity, with huge advances in science, spirituality and medicine. Clu saw these ISO's as an imperfection and launched a vicious war of annihilation against them. Both Flynn and Tron tried to stop Clu in his efforts. He had become to powerful and Flynn was only able to make his escape due to Tron fighting Clu and holding him back as Flynn fled. During his exile in the Outlands, the portal to the real world collapsed and Flynn, alone and seemingly without any way back, was left to ponder on his fate. Flynn told Sam that there may be one man capable of helping him get back to the real world. His name is Castor and he runs the End Of Line Club, situated in the city. He has contacts to what could be termed the underworld on the Grid and could put him in contact with Zuse, a program who will give Sam the vital information necessary to get back home. Using His fathers light-cycle to get to the city, he soon finds himself in what could be the digital world equivalent of a bar and nightclub. Castor is a flamboyant and slightly camp program who immediately recognises Sam for who he is and is willing to help him. Taking Sam into his office, he reveals to Sam that he is Zuse and says he will help him. However, turning the tables on Sam, he calls in Clu's guards. A fight ensues and Sam is on the ropes. Flynn and Quorra turn up just in time to save him but in the process, Flynns disc is taken from him by Clu. Flynns disc also acts as a master key to the System and with it, Clu is unstoppable. During their escape, Quorra is severely wounded and Flynn knows he will have to act fast in order to save her life. Meanwhile, back at the club, Clu turns up, and in an act of callous brutality, takes the disc from Castor and destroys the club. Knowing that they have the information vital to getting back to the real world, they stow away on a revised simulation of the Solar Sailer, making its way towards the portal towing an undisclosed cargo. During the journey, Flynn tells Sam more about his time in the System and reveals to Sam an astonishing fact; that Quorra is the last surviving member of the ISO's and has taken refuge with Flynn. During their flight to the portal, Quorra is healed by Flynn and she reveals to Sam it has always been her dream to visit the real world and see a sunrise. All too soon the solar sailer docks at a station on board a massive warship. On board are Clu and his minions mustering a huge army of tanks and other weaponry. Sam then finally learns what happened to most of the programs who were captured when he first arrived in the electronic world; they are being reprogrammed and turned into a fighting force of a magnitude never seen before in the system. It was then Quorra is captured by Rinzler while over hearing what Clu is saying to the army amassed below him. Clus intentions are to take the ship through the portal into the real world and to 'perfect' it. Sam and Flynn then go up against Rinzler, recapture his disc, rescue Quorra and make a break for it in a shuttle. It is then that Flynn recognises Rinzler for who he truly is: a reprogrammed Tron. He was not killed when he and Flynn went up against Clu all those years ago but was taken captive and turned into a lackey of Clu's. Arriving at the portal, they find their way blocked by Clu. They try to appeal to his better nature but he is having none of it so after a battle in which most of the portal building is heavily damaged, Flynn sacrifices himself by fusing Clu back into himself amid an explosion of light as the two digital beings fuse. It is at this moment, Sam, holding his fathers disc with all the information of the system stored on it, and Quorra can step into the tower of light that is the portal and transport themselves back to the real world. Phew, what can I say? It was sensory overload first time around but with the sequel, it was very much a case of the film having to be made, the budget that was allowed and the benefit of a 28 year advance in computer and animation techniques. The original movie, even though it had mixed reviews and turned a modest profit when it was released, had been gaining a cult following worldwide. The possibility of a sequel had been bandied around since the late 80's but never took off. It was only the screening of a section of test footage at the San Diego Comic-Con 2008 did things really blow up and set the internet alight. The scene of a light-cycle contest between an unknown warrior and a younger version of Kevin Flynn made the audience go bananas and set the scene for the most eagerly anticipated sequel of modern sci-fi movie-going years. The footage shown at Comic-Con was not actual footage from the movie but was there to prove a point. 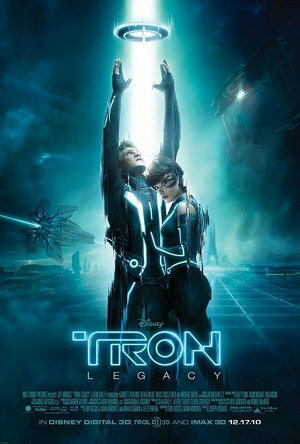 Even though a quarter of a century had passed, Disney was very serious about making a sequel to Tron. They felt the time was right to make a sequel. Steven Lisberger was still labouring under the false impression that Tron was a failure and Disney wanted to give him carte blanche in order to vindicate himself. They devoted a considerable amount of budget to promoting an advertising campaign for the film. The most notable of these was a viral campaign stating that 'Flynn Lives!'. They were eager to capitalise on Kevin Flynn vanishing and the campaign was very much like an Easter Egg Hunt. Leaving clues over the internet, any lucky person who followed the clues was rewarded with prizes like advanced screenings and such. As is the wont with movies and TV programmes, the ugly spectre of product placement can rear its ugly head. Disney and Nokia hatched a plot to make sure their mobile phones featured in the film. My wife, Fake Crumbly to our listeners or Jane to me and friends, bought a Nokia N8 last year, a month or so before Tron Legacy was released and had nothing but trouble with it, culminating in all the pictures she had taken on it being lost and the phones software finally crashing with The White Nokia Screen of Death. Could you have imagined that happening in the movie? Sam Flynn uses his phone keypad to break into the Encom basement only for it to crash and a voice off screen shouts: "Cut!". The producers of the film must be given kudos for pulling together a perfect cast for the film. Garrett Hedlund, cast as Sam Flynn, is very much his fathers son. Haunted and bewildered by his fathers mysterious disappearance, he is young, adaptable and quick to learn. He knows as soon as he is propelled into the digital world, he has to hit the ground running in order to survive. Jeff Bridges returns as Kevin Flynn / Clu. Digital mapping and reproduction of Jeff Bridges face has enabled the producers to pull off something of a coup. The same man appearing as two separate incarnations of himself, one middle aged and the other youthful. The years of Flynn visiting the system has caused it to evolve from the blocky, rectilinear landscapes with its primitive graphics to a world that is more life like, complex and slightly sinister due to the malign influence and dictatorship of Clu. Kevin Flynn has seen his semi-divine status as a User change to that of an elder statesman in the system. Now that the inhabitants of the Grid know the Users to be beings quite like themselves, Clu has used this to his advantage and manipulated them into thinking that Flynn is not a saviour but a perceived threat. Bruce Boxleitner as Alan Bradley/ Tron makes a very welcome return in Tron : Legacy. Enough has been said elsewhere about his past history as an actor by me so I won't dwell upon it here. In this movie, the character of Alan Bradley / Tron takes a bit more of a back seat as the emphasis is on the Flynn/Sam/Clu story line. Olivia Wilde as the female warrior programe Quorra provides a much needed diversion to the standard eye-candy of many a film. Even though she is a skilled warrior and technically proficient in many forms of combat in the electronic world, she is still very much an innocent where it comes to interaction between people. She sits back and looks on the rather awkward reunion between father and son with amusement whilst reclining at ease on a chaise-longue in Flynns refuge. In a role-playing scenario, she would very much be a cleric, or in other terms, a holy warrior; skilled in warfare and arms but also deeply pious and drawing faith from their beliefs, in Quorra's case, her belief in the Users. No self-respecting American-made movie would be complete without a supporting cast of British actors to give it much needed gravitas and integrity. Michael Sheen as the owner of the End Of Line Club; Castor. Camp, flamboyant, and sexually ambivalent, his appearance owes a lot to David Bowie's Ziggy Stardust creation with his swept back mane of white hair, skin tight jumpsuits and swagger stick. He is amoral and deceptive and working to his own agenda and will side with the person who will best suit his needs and further his interests at that particular moment in time. Michael Sheen has an impressive track record and notable roles have included a rather simpering Tony Blair in the acclaimed film 'The Queen', and the British interviewer David Frost in the Ron Howard-produced Award-winning movie 'Frost Versus Nixon'. The British contingent is also ably supported by James Frain as Clu's lieutenant; Jarvis. The last TV production I saw him in was 'The Tudors' ; a rather stylised telling of the life of King Henry the 8th. James Frain had the role of Chancellor Sir Thomas Cromwell, who met a rather messy demise at the executioners block. His most recent role is that of a dapper English vampire in the steamy Southern vampire drama True Blood. I do find it rather hard to compare the ermine-robed and elegant Sir Thomas Cromwell with that of a shaven headed lieutenant of Clu's, complete with a semi-transparent visor-like affair starting down from his scalp to form a shield over his eyes. I must confess that I has some misgivings about Daft Punk providing the soundtrack for the film. My only previous exposure to them was the dubious Euro Disco song; "One More Time" so I had dire visions of the soundtrack sounding more like a drunken week in Ibiza, complete with straw donkeys, full English breakfasts and fizzy lager, rather than sounds hinting at a dark and futuristic world.Upon listening to it, I was very pleasantly surprised that they drew their influences from a wide variety of musical sources. Monsieurs Guy-Manuel De Homem-Christo and Thomas Bangalter even made a cameo appearance in the movie as two Mp3 files who were the resident DJs at the End Of Line Club. It was definitely a case of completely revamping certain elements of the original movie while still retaining elements of the original. The appearance of the digital world I have commented on previously but for instance, the light-cycles are much closer to what they should have looked like in the original movie. The original idea was for the light cycles to have an open cockpit but computational power being what it was back in the early 80's, it would have taken too many polygons, pixels and computing speed than was available so the idea of a closed cockpit was agreed upon. The new lightcycle, designed by Daniel Simon, was more sleeker, with spokeless wheels, an open cockpit and shielding to stretch over the riders back to make it more streamlined and aerodynamic. The Recognisers are less straight-edged and look more like a functioning craft rather than the assemblage of free-floating shapes that they used to be. Sadly, while the Solar Sailer is still graceful and reminiscent of a dragonfly, it has been relegated to the status of a tug, pulling cargo along the light-beams of the system instead of being what it was supposed to be; a graceful pleasure craft. The garb that all programs wear has had an overhaul as well. Gone are the circuitry line-bedecked costumes, to be replaced by black one piece wetsuit-like affairs with sparingly-used illumination. Gone too are the Cooper ice hockey helmets, to be replaced by cycling helmets with visors that flip down over the face whenever the program goes into battle on the Grid. By the time of writing this review, the movie had taken over $400 million worldwide, more than enough to justify making another sequel and creating an animated series: Tron: Uprising, due to be screened in the US next year. On its opening weekend in the UK, it turned a very respectable £1.9 million. Listeners to our fair podcast have heard me, in a fit of bellicose indignation, take umbrage and drag the name of Chris Tookey, I repeat, Chris Tookey, movie critic of the Daily Mail, through the mud for dismissing the movie out of hand and not giving it any serious consideration. In winding up, there are a few things I need to say. 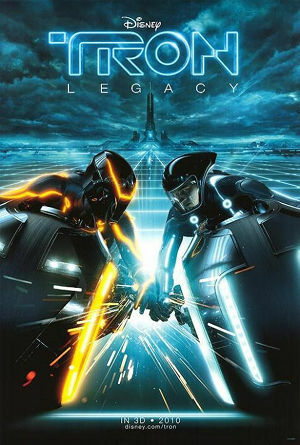 Tron: Legacy is very far removed from its honoured predecessor in the fact that a lot of fans grew up knowing only the original 1982 movie. It is still very much the same theme as the first movie, in the fact that it is all about a man thrown into very strange circumstances in a world far beyond anything we could imagine. In all honesty, the film will need to be viewed a few times more due to the fact of the gulf of 28 years between original and sequel. The two movies have very much got to be treated as two very separate entities and not the latter merely being a continuation of the first. It may take some time for the two films in my mind to be reconciled but buy the DVD when it is released and draw your own opinions. Many people have pooh-poohed it as a remake of the first movie but in this instance, I must strongly disagree. One of the themes I mentioned at the start of this review is that of family and how they can be torn asunder and brought together again and how one mans best intentions can be warped into something more sinister.